We are a small charity employing about 30 staff, although many staff just work a few hours each month. We offer sector-comparable salaries, a positive working environment and a commitment to the personal growth and development of our employees. When we have vacancies they will be advertised on this website. Autism Berkshire is committed to safeguarding and promoting the welfare of children and adults with autism and expects all staff and volunteers to share this commitment. We will ensure that all our recruitment and selection practices reflect this commitment. Due to the nature of our services, successful candidates for a number of posts will be subject to enhanced Disclosure and Barring Service (DBS) checks, along with other relevant employment checks. Please note that Autism Berkshire requests no contact from agencies or media sales in relation to any vacancies advertised on this page. Autism Berkshire is a leading charity and services provider, dedicated to helping autistic people living in the county, and their families, improve their health and wellbeing, along with their sense of security and quality of life. We are looking for someone with experience of working in a family support role and experience of autism, whether personal or professional, to run workshops and support groups and carry out home visits to advise parents and carers while they are waiting for an autism assessment for their children, after they have received a diagnosis of autism, or if they are in difficulties at any time. 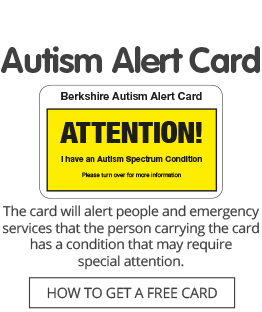 Most of the work will be in the Bracknell, Slough and Windsor & Maidenhead areas but, when available, the postholder will also be expected to answer Helpline enquiries at our office in Reading, provide drop-in advice about autism to visitors to the office and run workshops in other areas of Berkshire. Autism Berkshire currently delivers the National Autistic Society (NAS) Autism Seminars for Families programme at its workshops. A detailed knowledge of autism and of health, social and voluntary sector services in Berkshire are essential and previous experience working in the voluntary sector would be an advantage. The role is home-based but the successful applicant will need access to a car and be able to drive to workshop and support group venues, home visit locations and our office in Reading, as necessary. The successful applicant will be subject to a Disclosure and Barring Service check. The post is offered on a seven hours per week contract basis at a rate of £11.54 per hour, for a fixed term until March 31, 2020, with the possibility of renewal, subject to funding. Download the job description and person specification and our application form using the links below. All applications must be made using the Autism Berkshire form. CVs will not be accepted. Please note that we strongly encourage informal visits to our office, prior to application, to discuss the role. If interested in taking up this offer, please email ceo@autismberkshire.org.uk or call 01189 594 594. In the subject line of your email please put ‘Application for East Berkshire Home Visit Support Worker job’. Applications can also be posted to us at: Autism Berkshire, 40 Caversham Road, Reading, RG1 7EB. All applications must be received at our office by noon on Friday, May 3, 2019, with shortlisting taking place on Monday, May 6. Interviews will be held on Thursday, May 9. The expected start date is ASAP. Autism Berkshire is launching new social groups for autistic adults in Slough and we have a job vacancy for a part-time support worker to assist the social group’s co-ordinator with the running of their meetings. The main group will meet fortnightly on Tuesday evenings at a pub in Cippenham. The successful applicant for the post will also be expected to assist with the running of a new support group for autistic women in Slough meeting monthly. We are looking for someone with good knowledge and understanding of autism, experience of working in a support role in an education, health or social care setting, preferably with adults, and a commitment to helping autistic people and their families. Experience of working in the voluntary sector is desirable. This post is offered on a fixed-term contract basis at a rate of £9.24 per hour, initially until December 31, 2019, to cover three 3-hour meetings of the groups each month. 28 days’ holiday, pro rata. There is the possibility of renewal, subject to future funding being secured. Please note that we encourage informal visits to our office, prior to application, to discuss the role. If interested in taking up this offer, please email ceo@autismberkshire.org.uk or call 01189 594 594. In the subject line of your email please put ‘Application for Slough Support Worker for autistic adults’. All applications must be received at our office by noon on Friday, May 10, 2019. Interviews will be held in the week starting Monday, May 13. Autism Berkshire is looking for new volunteer trustees to help guide its work delivering a wide range of advice, support, training and leisure activities throughout the county. Click here for a role description for the post of Autism Berkshire trustee.